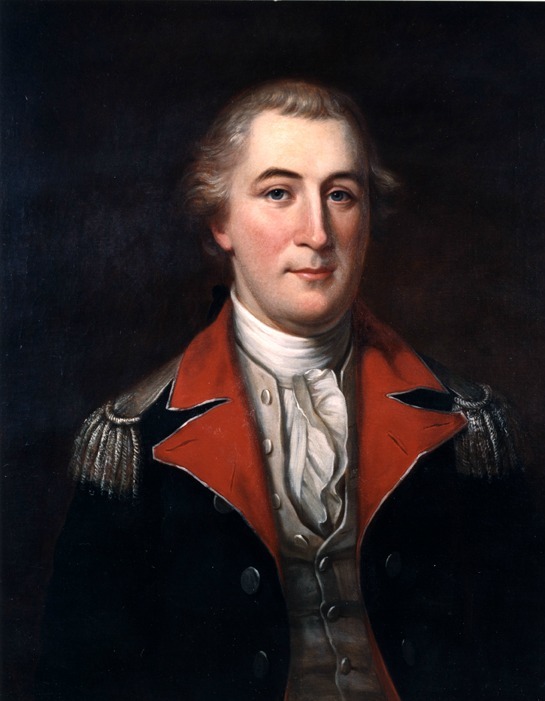 In this Joseph Reed letter to Col. John Glover, Reed discusses various issues relevant to supplying the Continental Army troops during the Siege of Boston in 1775-1776. Reed was an aide to George Washington who would later be a delegate to the Continental Congress and a Governor of Pennsylvania. This letter is relevant to the examination of the appearance of the first US Navy flag, known as the Washington Cruisers Flag, because Reed is thought to have chosen the final design. In the letter he asks Col. Glover his opinion and describes features of the flag. Colonel John Glover was a captain in the fleet of schooners hired personally by Washington to keep British ships from bringing supplies to Boston. Glover founded the famous Marblehead Regiment that ferried Washington and his troops across the Delaware River on Christmas night 1775 to their victories at Princeton and Trenton. GENTLEMEN: Your favour of yesterday was duly received. The two hundred and sixty dollars Mr Moylan will keep till he returns, and then pay it to the Commissary-General. I sent for Colonel Burbeck, who makes some excuse that he could not get the order ready, but promises it shall be this day completed. 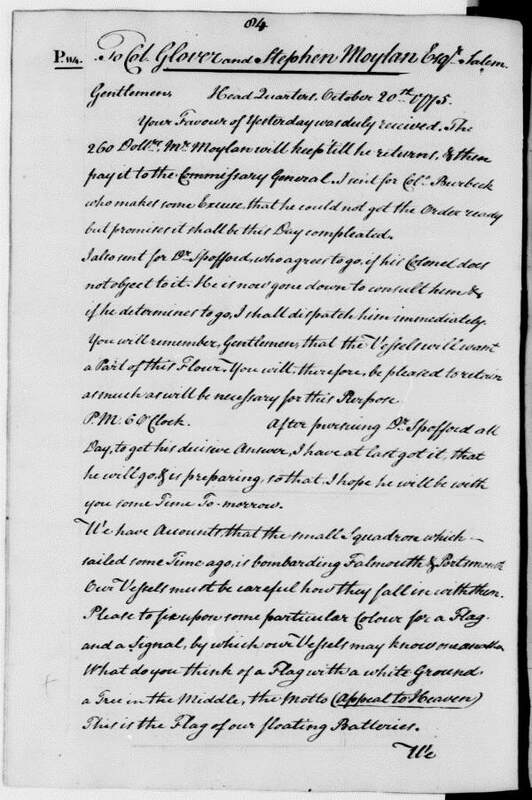 I also sent for Doctor Spofford, who agrees to go if his Colonel does not object to it. He is now gone to consult him, and if he determines to go, I shall despatch him immediately. You will remember, gentlemen, that the vessels will want a part of this flour. You will, therefore, be pleased to retain as much as will be necessary for this purpose. P. M., six o'clock. After pursuing Doctor Spofford all day, to get his decision, I have at last got it, that he will go, and is preparing; so that I hope he will be with you some time to-morrow. We are fitting out two vessels at Plymouth, and when I next hear from you on this subject, I will let them know the flag and the signal, that we may distinguish our friends from our foes. You will hasten the equipment of the other two vessels as fast as possible. Be pleased to prepare half a dozen reams of the best writing paper to be had in Salem or Marblehead, and send it down here per first opportunity. If you think any good purpose would be answered by it, you can send out Colonel Glover's schooner till the substitute is got ready. I am, Gentlemen, with much regard, your most obedient humble servant, J. REED, Secretary. To Colonel Glover and Stephen Moylan, Esq., Salem. P. S. Colonel Glover does not notice the receipt of Captain Langdon's present to the officers who retook his ship. Don't let it be forgot in your next. Learn more about the Washington Cruisers Flag here. And read more about George Washington at our George Washington Facts page.